The Scrap Dance Tango pattern is now available in my Craftsy store. Thank you to all who participated in this fun mystery quilt along! I am currently in the planning stage for more mystery fun with our scraps! I can’t decide whether to do a small one for autumn / holiday, or just wait until next year for a full quilt. Which would you like? Or do you want both of them? Either way, save those scraps! Click on Scrap Dance Tango! I hope you will consider purchasing the pattern, as it is those sales that support the costs of the blog and make it possible to bring you new and free projects. Thank you!! This is a really cute pattern, Carole. I hope you have a fun week-end. 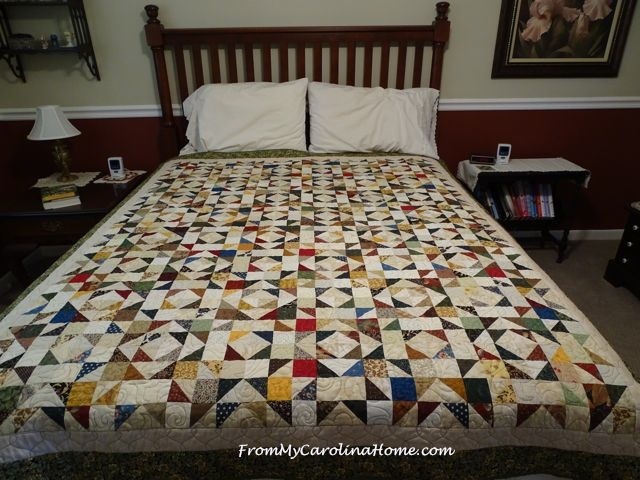 Beautiful quilt Carole! I think you should make a autumn/holiday and….a large one! I love this quilt! And I would like you to do both, I love mysteries, AND I love scraps! I vote for another big one! I already have too many fall projects and not enough room to display them…Thanks for such an amazing mystery quilt–I already gifted it away! Love it…I am still working on mine. My sewing room is in the basement and we are having it finished. So I had to pack up everything for the next 6 weeks. Can’t wait for an awesome sewing room and getting back to finishe Scrap Dance Tango. I have plenty of scraps so I will be waiting for the next mystery. Thank you so much. 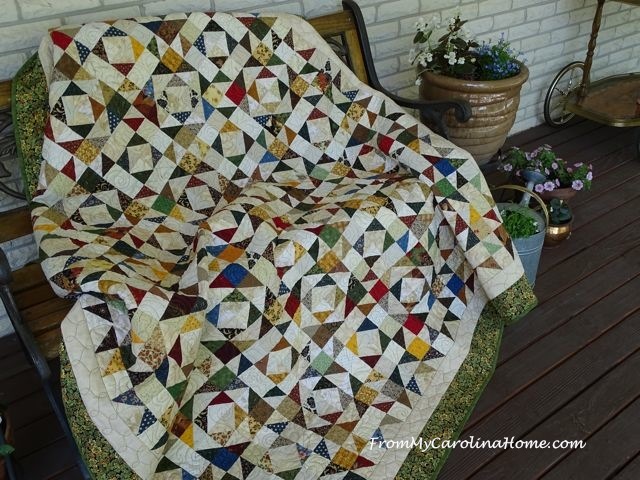 I love this pattern and love scraps and a mystery Christmas quilt would be welcome.Thanks for sharing! Beautiful quilt. Too bad quilting isn’t one of my skills. I did want to report that I received my Wool Bundle prize from Primitive Gatherings. Thank you for entering me in the drawing. I’ll have to think of a good use for the wool. Maybe a Christmas idea. Small one for autumn would be nice. What size scraps do you save to use (how big/small) ??? Material from Etsy store arrived. It was just perfect. Thank you. I never have to save them, they are always overflowing. LOL I look forward to seeing what you decide to bring us. I’m on overload for the summer and can’t even think of planning ahead right now. The quilt looks great on your bed. Congratulations on getting the pattern published! I will share that on my blog!!! My S.D.T. is quietly hanging in the sewing room, in line with those other projects that need attention. It needs borders still, but I have had to “bump ahead” with other things. Really I am looking for an excuse to pack 3 king size quilts into a suitcase and fly out to California and “visit” my sister in law and practice my long arm quilting. I do look forward to your mysteries; and will stick to “table runner” size for the next few~ My scrap bins are multiplying. You have such pretty scraps! I hope your pattern sells well, it’s a lovely design. Thanks for linking to MCM! Do both, please. My scrap bin is overflowing. I’d love an autumn palette for one. Thanks for your inspiration. My blocks are finished, but I’m having a devil of a time puting them together because the seams don’t all nest, so I have to keep slitting and flipping some of the seams. I’ll get there eventually. What a great pattern. Lovely!! Congratulations on the new pattern! You know I’ve got scraps to use – just gotta find the time to use them! Whoop whoop for a great finish!! Congrats on a beautiful quilt and pattern! Your Scrap Dance Tango is gorgeous! It’s been fun seeing others that people have finished. I love making seasonal table runners, so I would enjoy following along if you made one! I hope you see lots of pattern sales – the quilt is lovely! Give me a heads up when you are ready with your next scrap mystery and I will feature it on Oh Scrap!